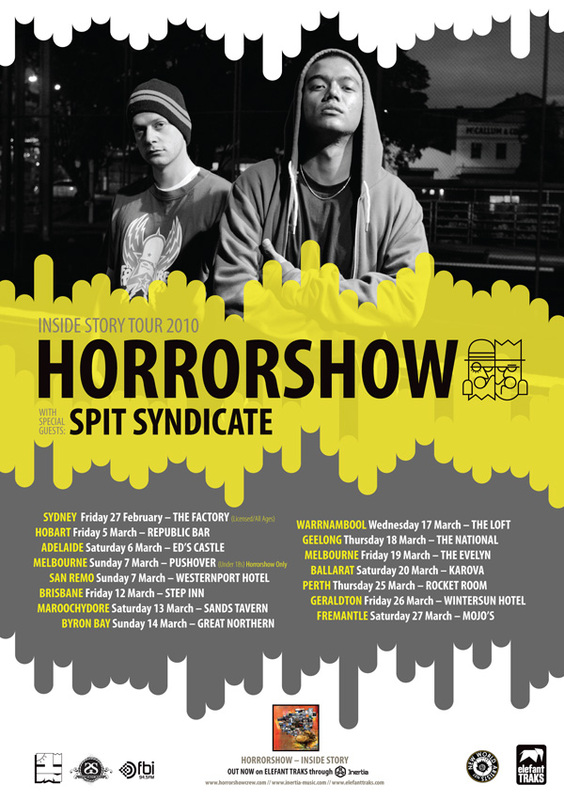 Sydney’s Horrorshow are set to head out on tour in late February to March 2010 with their good friends Spit Syndicate. The lads from Horrorshow will be starting in Sydney at The Factory for a licensed/all ages show on the 26th February 2010 and finishing up in Fremantle at Mojo’s on March 27th. Tickets can be sought from OzTix, so checkout the dates below and go order your tickets, these lads are definitely not a performance you want to miss. Elefant Traks are proud to announce Horrorshow are embarking on their first national headline tour in Feb and March 2010. Hot on the heels of their second album Inside Story, named ‘Best Hip Hop album of 2009’ by Sydney Morning Herald and featured on triple j, Horrorshow work hard not to put a foot wrong. Solo and Adit have developed a big following for their insightful lyrics and smooth production – as well as an entertaining and energetic live show. The excitement surrounding this 21 year old duo is exciting in itself. Special guests for the tour are their fellow One Dayers, Spit Syndicate, who’re currently working on the follow-up to their highly regarded debut album Towards the Light.